Managing your finance is very essential. But when you are on the go it becomes almost impossible to track and manage your finance. However, for most iPhone and iPad users there seems to be a solution. Apple applications come for various categories. 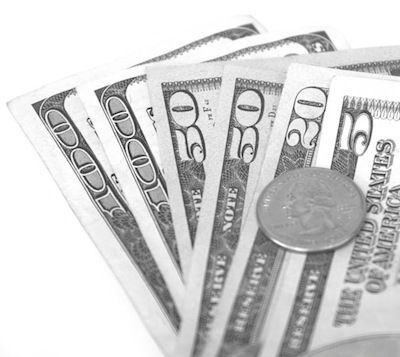 The category finance is one of the most important categories. Though Apple apps have a price tag, some of them can be downloaded for free. Here are the top 5 finance applications which are free. 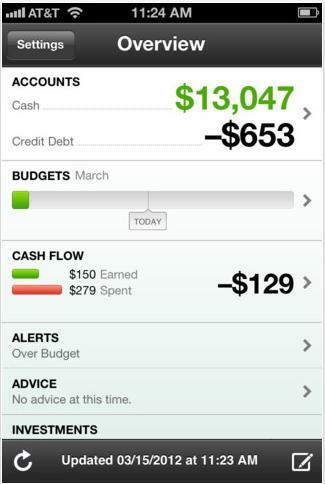 The personal finance manager provided by Mint is hailed as the best by many users. Its ability to track all your account in one place is its special feature. All types of accounts can be managed easily. The transaction is safe and secure without any hassle. A graph displays the expenditure and the purpose. This allows you to keep an eye on where your money is actually spent. Alerts on pending bills are sent to the device immediately. Another interesting feature is the ability to view the data without a wireless connection (only for iPad). Another application is the Piggie. It has a clean user interface. Users can opt for the classic view or the dashboard view. Tagging support is available through which vendors or credits can be tracked. The managing of the sub category is easy. Customization of the categories can be done on the fly. It is integrated with dropbox so that the data can be imported, exported or backed up. Searches are generally recorded which eases frequent search for the same word. Its special features are the customizable font size, customizable month start and the retina display. Finally the instant exchange rates are an added bonus. Though this item is completely free it comes with an upgraded paid version which has further benefits. 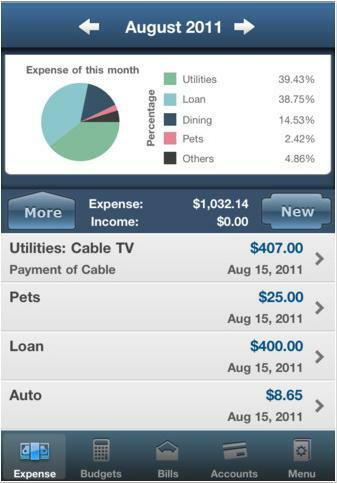 Pocket Expense Lite supports multiple accounts. You do not have to manage each account separately. Once you are signed in, all accounts are managed through the single page. Statistics are provided for your weekly/monthly/yearly expenditures. Managing budget through this application is easier. Set yourself a limit and then you can go on your shopping spree. Special feature is the tracking of bills. The alert period can be customized. Bills that need to be considered at the earliest can be given importance and you will be alerted accordingly. A calendar view helps with the upcoming events. 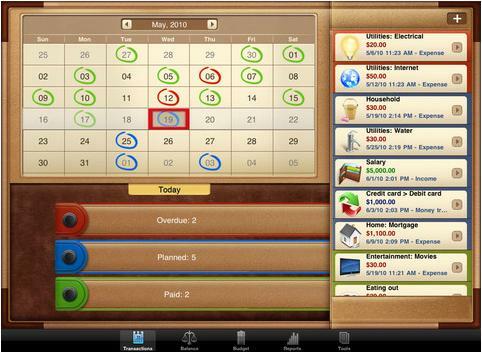 It has all the features of the other applications like managing all your accounts from a single page. 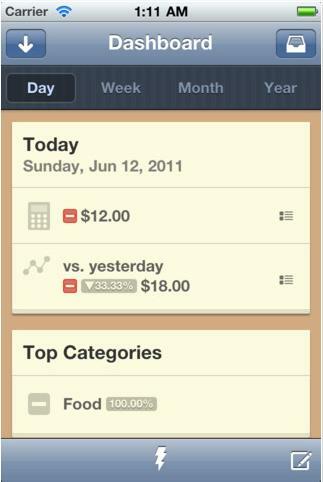 Instant notification of bills and calendar view arrangement is also possible. Special features include budget section which helps in planning of budget. You can avail reports for a single item. The design is enticing. In short everything about this application will make you feel as if you are organizing over a paper. This application is not exactly free. It comes with a trial version through which your transaction is limited to 25 times. After this transaction limit has been crossed you will have to purchase the original version. Features are all the same as that of others. 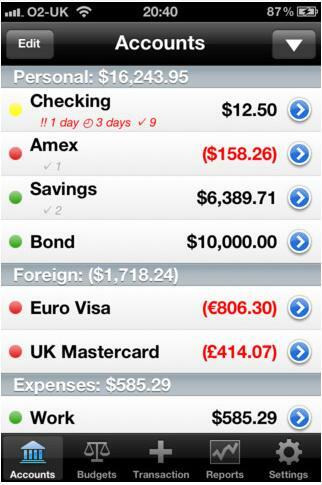 However, it does have some advanced features like calculating the amount you will spend for 2 years in advance. Once you are done with 25 transactions you account data will be transferred as soon as you purchase the full version. Therefore, it saves you from losing the data. Guest article written by: Richie Richardson loves to write about Social Media Marketing and Internet Marketing. You can reach him over his blog Zarrylyms. He also writes for [tp lang=”en” only=”y”]tesco voucher codes[/tp][tp not_in=”en”]tesco voucher codes[/tp] which can be used to avail discount while shopping. I personally use Mint.com and have found it to be a great money management tool. I’ve actually been using it since it was called “Quicken.” I’ve tried to convince everyone I know to use this app because I think a lot of people don’t have a good idea as to where their money is actually going. Once you know (with the help of the app), you can actually do something about it! Thanks for the other app suggestions, I’ll have to take a look some of them. Finance management is very important for the business but by seeing the features of these application now it seems very easy. Nice collection of apps. I’ve been looking around for a decent replacement for Microsoft Money for ages. Next post: Why Avast Antivirus Is So Popular?